Despite being a predominately muslim and Hindu country there is still a large amount of christians who call India their home (about 2.4%) . While Christmas in India may not be as big as some of the other religious festivals in India such as Holi, divali or Muharram, it is still widely celebrated and great fun.Like the rest of the world (almost), Indians celebrate christmas in the 25th but while in America and other european countries where christmas decorations are in the shops and celebration being organised by mid summer, in India things are a bit more low key and christmas in India is a lot more about religion that the presents under the tree. 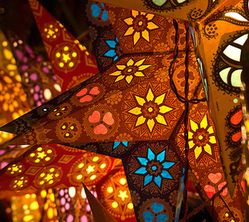 Despite being a Christian event, christmas in India is also celebrated by many other religions, predominately the Hindus. In schools, a nativity play is perfomed, just like ere in the west and manger making competitions are also held. Paper lanterns are made and hung between house along streets (most of whhich are what’s left over from Diwali, the Hindu festial of light). In southern India, clay lanterns are made and put on window sils and ledges and in the North devotees spend a week before Christmas travelling the towns and villages singing hymns. Best place to go for Christmas in India? Perhaps one of the highest concentrations of christans in India is in Mumbai (Bombay) and consequently it is here that the celebrations are most obvious. The majority of them, who in most cases are roman catholics, meet for midnight mass followed by a feast. If you decide to travel to Bombay to celebrate christmas then head over to one of the many churches and you will surely be welcomed. Because India has so many languages there are of course a great many ways in which you can say ‘Christmas in India’. I would say 90% of the people would understand ‘merry Christmas’ but if you’re not happy with that then try: "Shub Naya Baras!". Christmas in a tourist hotspot such as Goa for example is dependant on the other guests really. Of course the main religion of Goa is Christianity so celebrations are pretty hot there. But if your planning to just spend your day on the beach then don’t expect too much excitement. There are always a few raves on around Anjuna for example and some other parties and things at most of the other beaches such as Palolem. Christmas for a tourist in India is a special thing, especialy if your coming from the western world where for at least three whole months the world goes Christmas mad. Expect it not to be forgotten and ‘just another day’ (if there is such a thing in India) but at the same time realise that India and West are entirely different things and do things in entirely different ways. Relish in spending Christman in the sun, with a cocktail, a swim and and clink of glasses and a quick ‘merry christmas’ with another traveller also escaping the Christmas maddnes at home.